The artist reception for the sculpture show is Sunday, July 21, from 1:00 PM to 3:00 PM. This is a beautiful exhibit that is open through September 27, 2013. 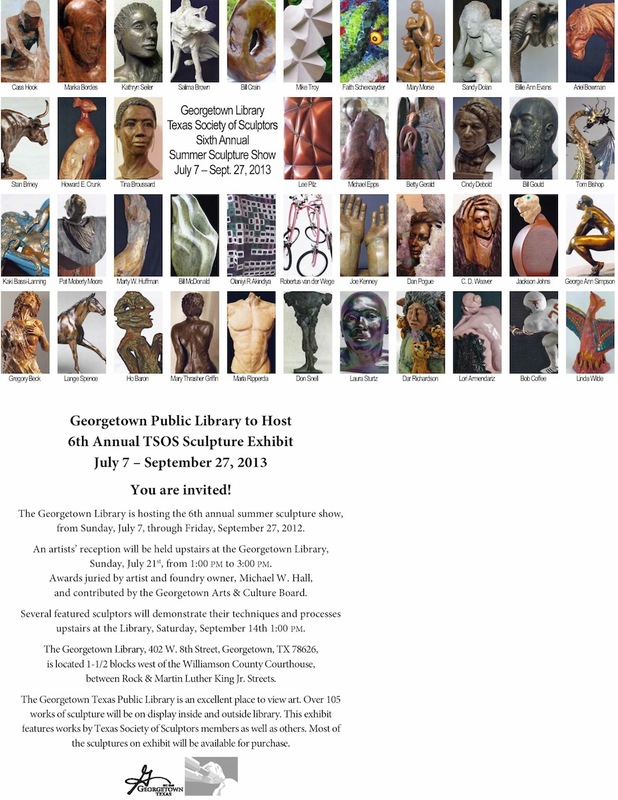 There are over 105 works of sculpture on display at the library. The library is a few blocks from the town square at 402 W. 8th Street, Georgetown, TX. If you visit the library, you will see Marika’s two new sculptures, From Dream to Fairytale and The Storm, and the very tall Gwaihir standing at 14′. Below is additional information about the show. This entry was posted in Fine arts, Sculpture, Sculpture Exhibition, Wood sculpture and tagged artist reception, arts, Georgetown Library, Georgetown Texas, marika, marika bordes, sculpture exhibition, sculpture wood, Texas Society of Sculptors, transportation. Bookmark the permalink.